Originally published in the Toronto Star on August 5, 2003:Â The Iran that CNN doesn’t show us – the daily existence of a country in flux. Â No booze, but Doctor Quinn, Medicine Woman, dubbedin Farsi. I am suspended in an airplane somewhere between Toronto and Tehran, and my ignorance covers me like a chador. Â My Eastern complexion has in the past camouflaged me as a full-blooded native Iranian, but in this cramped and noisy box I am quickly betrayed by my flat Canadian vowels. Last summer, I embarked on my first visit to Iran, the country of half my heritage. Â Bereft of tongue and custom, I possess little of the rich inheritance that is my birthright.Â The Iran of National Geographic is an exotic wonder, or it is a stifling desert with gracious peasants. Â The Iran of CNN is a horde of turbaned men, often Islamic fundamentalists, sometimes terrorists, always hostile. The Iran I am about to experience is a very narrow Iran. Â It is the country of the affluent few percent. Â My great-grandfather was one of the richest men in the Northern provinces, and the remnants of his astonishing wealth still tinkle faintly in the purses of the second and third generations. Â I will see neither the poor carpet-weaving villagers, nor the bluish opium addicts, nor the blazing skies of the Southern deserts. Â Not this time. 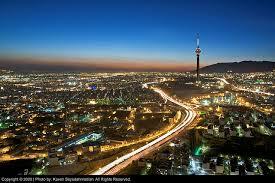 At 7:20 PM Tehran time, we hove over a city that glitters with the famous “lights of Tehran”. Â The airplane rustles audibly with women donning hijabs – veils for the hair. Â Hijab is more than a garment, it is a mentality. Â These women must remember, if only for a time, that modesty is the only ornament permitted a woman – officially speaking. The number of women in this airplane who have been boldly bareheaded for the past several hours hints at the true esteem in which some circles hold officialdom. Â Iran is the only Islamic republic in the Middle East, and since 1979 (the Islamic Revolution), Iranian women have been required to cover all but their face and hands. We step out into an astonishing heat. The first shock occurs at the instant I awake on the first sweltering morning. Â Nausea is rising in my throat. Â It is the smog. Â Tehran is one of the most polluted cities in the world. Hot, dry Tehran is situated on a slope at the foot of Mount Damavand, and the poverty is correlated almost directly with one’s altitude. Â The basin of the city is littered with the hovels of the very poor. Â My grandma’s gilt and spacious apartment is near the very top. The city sleeps when the heat becomes excruciating (from about 1 to 4 P.M.). Â Everything of interest happens in the night. Â And so when six o’clock comes at last, we head to the night bazaar, which sprawls indoors and out over several floors. Â At the bazaar, the confident, sturdy infants of the poor try to sell us vegetables. There are no drinking fountains here in the bazaar, but there are taps. Â Everyone sips from the same dubious tin cup. Â Though sweating and stifling, I instead nibble at a huge ice-cream cone, which is gracefully extruded in a foot-long spiral and drizzled with chocolate. Â Everything seems to be permeated by the same musky nutty flavour – the yellow pistachio ice cream with the sweet astralagus chunks, the vast piles of complicated carpets, the fresh soft pistachios that I taste for the first time, my grandmother’s rose-coloured hijab. In the lit streets of Tehran I am confronted with the second major shock: Â the increasingly ambiguous status of women. Â My CNN-riddled self expected to see the sea of black chadors and long faces that was the face of the 1980s and early 1990s. I am stunned by downtown Tehran. Â Women thickly paint their faces, fingers and toes; hair bursts through hijabs in sprayed waves, dyed or hennaed. Â The baggy black chador has almost ubiquitously been segmented into monteau (a knee to ankle length jacket) and hijab. Â Hardly any of the younger women cover more than two-thirds Â of their skulls. Â Tightly bound in black cloth, I have overdone it. Â A total stranger sympathetically urges me to loosen my veil. A heavily made-up girl in a transparent blue hijab and tight blue monteau bares her elbows. Â But this is risque. Â Boys catcall to her from vendors’ stalls. Â I am not sure whether to smile. In the blazing day, we stay inside to talk with my Uncle Michael or to coo over my baby cousin Sara. Â But in the cooler nights, we go out again into the endless bazaars and the Park-e-Mellat. Â Tehran at night is vibrant and loud and full of food. Â Young men and young veiled women appear to be chatting freely. Â Alcohol is forbidden, so the careworn men gather for a game of backgammon over a glass of tea. Iran seems confused. Â The mandate of the Islamic Revolution has not altered since 1979, but perhaps the people, citizens of what once – and to a certain degree still is – widely acknowledges as one of the richest, most beautiful and most modern countries in the Middle East, simply have not taken very well to sobriety Â The Persian passion for the artistic pervades everything from the colourful symmetry of the bazaar to the plush opulence of the Imperial jewels (which we visit in Bank-e-Melli – the National Bank – one morning). A sign in one shop reads: Â “Honourable Sister! Â The veil is the guardian of the chastity and ornament of a Moslem woman!” Â Such a sign might have been superfluous 10 years ago. Â Here in Iran, women attend university freely, perform surgery, practise law, even sit as one of the country’s vice presidents – but they are not permitted to sing in public (piped-in store music is always sung by a man) or leave the country without a male guardian’s consent. The literal meaning of the term haji refers to a devout Muslim who has completed the haj, the pilgrimage to Mecca. Â In Iran it has passed into casual use – a polite form of address used by the working classes. We wander into a neon mall, resplendent with greasy food court. Â The place is jammed with boys and girls. Â The menus at the “Star Burger” glow both in Farsi and credible English. In the morning, we visit the gorgeous Golestan Palace, one of the oldest monuments in Iran and site of the coronation of the Shah of Iran. Â On the way, I survey the milling streets. Â There are couples holding hands. Â This is forbidden outside of marriage, but I suspect the majority of these childless twosomes are unmarried: Â they are too young, too well-groomed and travel too lightly. We are stunned when some of the men climb over the bus metal barriers to sit in the Â back with the women. Â Nobody else bats an eye. Â I am not certain why street buses are considered venues sufficiently sensual so as to merit segregation: Â In the airport buses, taxis and streets, men and women arrange themselves freely. Â To my baffled unease, the majority of public bathrooms in the bazaars are unisex. We take a half-hour domestic flight to Isfahan, the famous city of the arts about 400 kilometres from Tehran. Â Isfahan was the old capital of the Safavid rulers in the 17th and 18th centuries and is probably the closest thing to a tourist town in Iran. Â Unlike the homogeneous Tehran, here foreigners are sprinkled with surprising frequency: Â Germans, French, British. Â In our hotel (the Abassi), the foreign women dress with dangerous freedom, but are let alone. In the Isfahan bazaar that crashes with the sound of pounding copper, the merchant of miniatoor art (intricate mosaic patterns made from tiny painted pieces) discerns that I am a tourist in less than three seconds. Â In Farsi, he asks my sister and me if we are “Alleman” – German. Â When we reply that we are Canadians, he jumps. Â Beaming, he yells in English, “Canada good! Â Canada very good!” and attempts to sell us a box made of camel bone at a just-for-you price. Later, when the heat subsides, we visit Ali Ghapoo, a six-storey castle with impossibly narrow winding staircases, marvellously frescoed rooms, and a roof with sunken baths. Â Ali Ghapoo is located in the hub of Isfahan in Imam Square, once called Nagsh-e-Jahan square. Â Near it is the Imam Mosque, once called Masjed-e-Shah – the King’s Mosque. Â After the revolution, monuments were hurriedly renamed in an effort to erase all traces of the Shah and his dynasty. In the Isfahan bazaar, my father is approached by a chador-clad woman with outstretched hands. Â He takes her to be a beggar. Â My grandma informs him that she is a prostitute. Â Prostitution is far more common than it apparently used to be, and the government is seeking a means of regulating it. One solution lies within Shi’a Islamic law itself, which provides for temporary marriages (mut’ah) to “seegha” wives. Â The marriage’s duration is specified beforehand; the union is dissolved automatically upon the agreed date, and both the man and the woman are free to marry again without censure. My friends, both dentistry students, tell me that this sort of marriage is a neat way around the laws forbidding men and women to touch. Â It is particularly convenient for Iranian film makers. Â Actors and actresses required to touch are simply married for the period of the shoot. Although the legality of temporary marriage is a huge source of controversy for Islamic scholars, rumour has it that the Iranian government is considering the establishment of a house full of women willing to become seegha wives for an hour or two. We have returned to Tehran to relax. Â Even with my appalling Farsi I am able to discern that local television in Iran is a boring nationalized affair. Â On the cooking show (the closest approximation to Emeril Live) a woman soberly makes halvah clad in a giant black chador whose sleeves brush the stove dangerously. Â The effect is rather funny. Â Even my grandma prefers the Iranian satellite channels braodcast from Los Angeles. We leave Tehran for a week’s sojourn in Babol – the birthplace of my father and grandma. Â It is three hours by car through mountainous terrain on a trail once called Death Road. As we near Babol, the parched scenery of Tehran undergoes a dramatic transformation. Â Dusty Tehran becomes a rainforest whose fecundity is almost tangible. Â Drops of water condense on the car window. Â Tehran’s heat was unbearable. Â But this wet, green heat defies all description. Babol, wracked by poverty, is in ruins. Â The residential area consists of a few shacks bordered by the walled palaces of the remaining rich. Its downtown is a tired bazaar. Â But this is home for my grandma, and she lives here most of the time on an estate with her chickens and ducks, her orange trees, fig trees and her two servants. Â Inside the air-conditioned mansion, I lounge about on a plush sofa watching the very popular Dr. Quinn, Medicine Woman (dubbed into Farsi) with my grandma. My grandma, who frowns at grubby Sully every time he Â sweatily appears on screen, was one of the most glamorous beauties of her day. Â In this gilded manor she once hosted parties for hundreds of guests. Like most Iranian houses, it has been furnished with a taste for the ornate – elaborate carvings and tasselled tapestries. Â Function is sacrificed to style. Â In the china bowls, even the sugar cubes (everyone takes their tea-sugar in cube form here) are decorated – iced with green and red sugar rosebuds. Babol is situated on the Caspian Sea, the largest lake in the world. Â Largely deserted after the revolution, the city and its vicinity are nearly dead. It is hard to believe my father’s stories of a wild seaside town where the children of the rich played on the beach whilst their parents tossed about thousands at roulette, where reckless casino men gambled their fortunes away inside and then stepped outside to drown themselves in the Caspian. My father is sad as my terrifically jolly great-uncle Nasser drives us around town in his almost brand-new car. Â We go to the beach on the shores of the Caspian, the same beach that was once a sprawling resort with a casino and a hotel. Today, the Caspian has been partitioned with long metal poles, and women are permitted to swim only in a roped-off black-curtained area of sea. Â Today, the casino is a hospital for the mentally ill. Â The casino’s adjacent pavilion is now a university. Â The hotel is a prison. It is impossible to capture in a still frame of a place whose essence is transience. Â In this mood of barely suppressed rebellion, everything feels temporary. The goodbye party is stuffed with food and people, all of whom are at least two hours late. Â By now, I am not surprised; Iranians are notorious for tardiness. Â The next time I see my little 18-month old cousin she will be a little girl, or a big one; when I see my grandma again she will have aged more perceptibly. Â Sour yoghurt, fatty milk, Koolak Kola, sweet garden fruit with every meal, new figs, old air. Â I even feel a premature nostalgia for the bottom-washers that every Iranian toilet is equipped with. Â I will certainly miss them in a hurry if my traveller’s diarrhea doesn’t subside before Toronto. When the guests have talked and eaten and kissed and left, Bahman and my uncle Michael drive us to Mehrabad Airport, a moist and chaotic place. Â Customs is a charade. Â The uniformed man barely looks up as he waves us past. I don’t know how to say good-bye to the family of friends that I knew nothing of three weeks ago. Â So I wordlessly kiss everyone once on each cheek, Iranian style. Â My grandma and I weep as we embrace for the last time. The wait is short. Â The airplane has not yet taken off when the last women folds her hijab away. ** Original article included a picture of me with a caption: Â “Showey Yazdanian strikes a pose on a perch at the 400-year-old Golestan Palace in Tehran. Â The marble throne she’s sitting on is located in a terrace of the palace called Khalvat-e-Karim Khani – the Cozy Corner of Karim Khani.